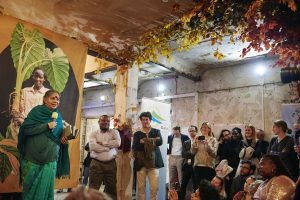 Vandana Shiva opened the We Feed the World exhibition at the Bargehouse on London’s Southbank on Thursday 11th October, in celebration of smallholder farmers and fisherfolk everywhere. Four thousand people visited the exhibition over its opening weekend. 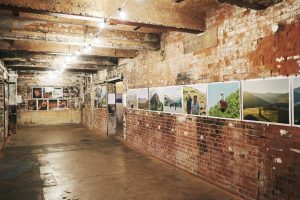 Over 4000 people visited in the first weekend to see over 300 images beautifully displayed across four floors, and to hear talks from well-known speakers including US activist, Anna Lappe, and Riverford founder, Guy Singh-Watson. 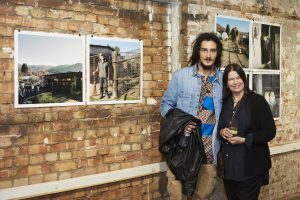 Curator Cheryl Newman with photographer Davide Degano from Italy. Project Director Francesca Price welcomes guests. 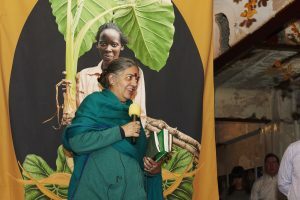 Delivering a powerful ten-minute speech in support of small-scale farmers and against corporations, Indian academic and activist, Dr Vandana Shiva, spoke about the need for everybody to support a fairer a food system for all. “Food is the continuum of our life and our freedom; there’s only one place where that nourishment will come” she told the crowd. “The care, love and passion of our small farmers; it is not a luxury for us to defend them; it’s an imperative. Food is not a product; it is life itself”. Visitors at the opening night enjoying a powerful speech by Jyoti Fernandez from the Landworkers Alliance. 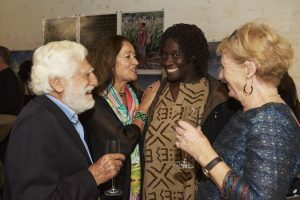 Among the 300 guests enjoying the opening evening, which was catered for by Petersham Nurseries, was Theo Sowa – Head of the African Women’s Development Fund – and Landworker’s Aliiance spokesperson, Jyoti Fernandez. Both spoke passionately about the critical need to change legislation and support activists who are at the forefront of this work. Watch all three speeches here. 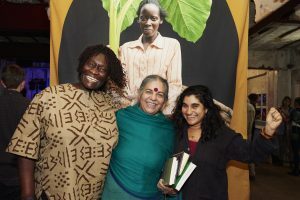 Theo Sowa, Vandana Shiva and Jyoti Fernandez. 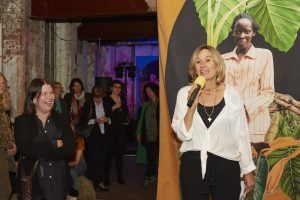 Three incredible women take to the floor at the We Feed the World opening. 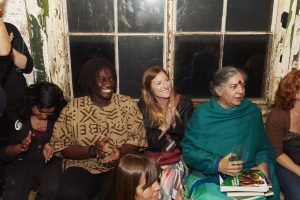 They were joined by Gaia Director, Liz Hosken, Project Director, Francesca Price, Curator, Cheryl Newman, Divine Chocolate’s Sophi Tranchell, Café Direct’s John Steel, Yeo Valley’s Tim and Sarah Mead and Riverford founder, Guy Singh-Watson. We were thrilled that so many of the farmers and photographers who worked on the project were also with us to celebrate its unveiling. Women farmers of the Embu community on the slopes of Mount Kenya. Celebrated in photographs by Omar Victor Diop, printed on banners. We Feed the World Exhibition, 2018. Photographer, Sophie Gerrard, who spent time photographing a crofting community on the Isles of Uist in Scotland said how moved she was to get to know the family and their way of life. Like many of the photographers who joined us for the opening of the exhibition, Sophie stayed with us in London for the opening weekend, marking the beginning of a ten-day programme of talks and events in collaboration with groups such as Sustain, the Landworkers Alliance and the Organic Research Centre. Sophie Gerrard who photographed crofters on the Scottish isle of Uist for We Feed the World. 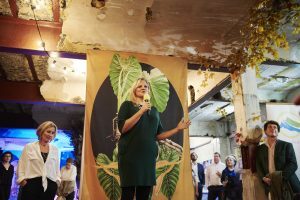 On Friday 12thOctober Sophie Gerrard was a panellist alongside John Vidal and Greenhouse PR asking what role the media have in telling the story of agroecology. 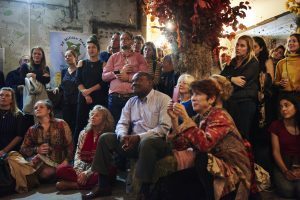 Other popular talks included Carnivore, Vegetarian or Vegan; What’s Best for Me and the Planet,with eco-chef, Tom Hunt, farmer, Gerald Miles and fashion stylist, Tallulah Harlech and Can Business Help Lead the Food Revolution which was chaired by the Guardian’s John Vidal and featured Riverford Founder, Guy Watson. Following the Good Food, Good Farming March on Sunday, US activist and writer, Anna Lappe, delivered a powerful speech in support of smallholder farms “who still produce as much as 70 percent of the world’s food and are stewards of three quarters of the world’s seed biodiversity.” She told the audience of 150 people. More talks continue over the course of this weekend. 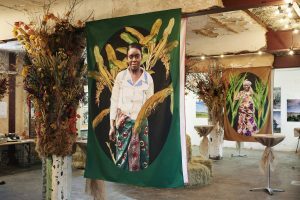 Highlights include exploring the importance of Fairtrade, and a day of talks featuring farmers and activists from around the world who are defending their lands against mining. Please see the programme here for more information. Photographs featured courtesy of Tom Groves Photography. Our gratitude to Petersham Nurseries for their incredible food and drinks on opening night.